“From neighbors who have recently visited Jackson Park to our north, we learned that you have returned to the Chicago area from your summer home in the boreal forest of northern Canada. Welcome back to the warm Chicago winter! We are writing to express our disappointment that you have chosen to stop in Jackson Park this winter, instead of continuing on just a few more miles south to our neighborhood. Call us spoiled, but it was very nice having a flock of you with us last winter. Even on the coldest days of January and February, we knew we could count on your cheery "dreeee" call, your constant energy, your tiny touch of red in the browns and grays of desolate Park 566. Sure, the Chicago Park District has shaved our park bare as they work to eradicate invasive plants, so good hiding spots are a bit scarce. But the brush clumps are still there in the sand piles where we hung out so often last winter. And we are not broadcasting this--so the Canada Geese don't crash our party--but the Park District has recently seeded the entire park with a variety of tasty prairie plants. It's easy pickings right now. The missive was signed by a dozen or so Tree Sparrows as well as a few Snow Buntings. There was also the signature of one American Kestrel, who no doubt had other reasons for wanting the Redpolls to visit Park 566. I added my signature. 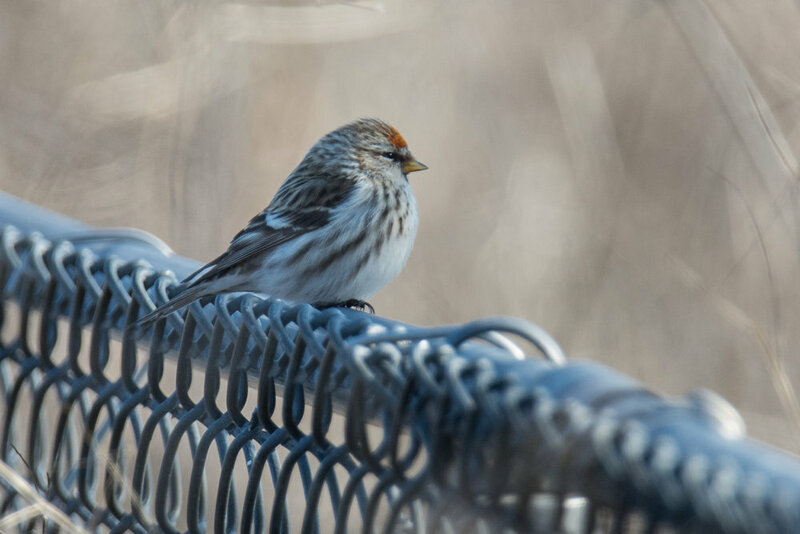 It's true, I was spoiled by the Common Redpolls who hung out all last winter in the nondescript South Shore park known as Park 566. Even on the coldest of days, when the wind was too strong to hold a camera steady, and frozen fingers were dead weight, those cute little balls of energy would suddenly swoop in--a flock of 20 or so birds--tittering and flitting about like they owned the place. Hanging from grassy stalks, scraping in the dirt, they would eventually get their fill and then suddenly disappear in a whoosh. Anyone who has them visiting a backyard feeder knows exactly what I'm talking about. It's also true that the bare Park 566 was just seeded. The Redpolls could have a field day there right now, especially since they are specially equipped to take advantage of the bounty. To keep those tiny bodies warm, Redpolls have to eat almost half their body weight in seeds every day. To help with that, they have special throat pouches where they can stuff enough seeds to keep their body's furnace fed for 3-4 hours. They can fill the pouches, like a chipmunk, and then fly off to a safe hide-out with enough munchies to last an entire football game. I miss the Common Redpolls, and I hope they read the note and come to spend some time in Park 566 this winter. It's just not the same without them.